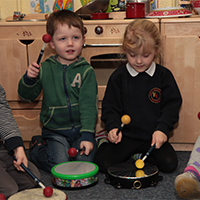 A very warm welcome to Early Learners' Pre school website! We hope that you will enjoy visiting our website and that it will provide you with a good insight into our vibrant, happy and successful Pre school. The staff are caring, experienced and committed to meeting the individual needs of every child, and to creating a happy, secure environment. We welcome children from their second birthday. Funded and payable hours are available. "The consistent support, encouragement, praise and attention both my daughter and I have received has been appreciated and crucial in her development. Early Learners always keep you in the loop......"